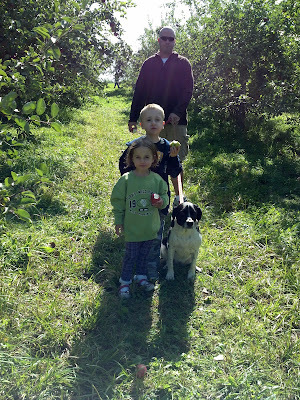 This year we decided to go apple picking in Maine on our way home from Storyland. This was actually a brilliant idea! No silly lines, hay rides, etc and much more fun. We also picked twice as many apples as usual for half the price. It felt like a Rey Wells move finding this orchard in the middle of no where, but Grandpa IS right sometimes. Chris is turning into his Dad more and more each day! You can play Where's Waldo with these pics because the kids climbed every tree. Climbing is their new favorite past time everywhere we go. Not good for a mother's heart. And only in Maine can you bring the dog. Regina doesn't ever like to be left out.